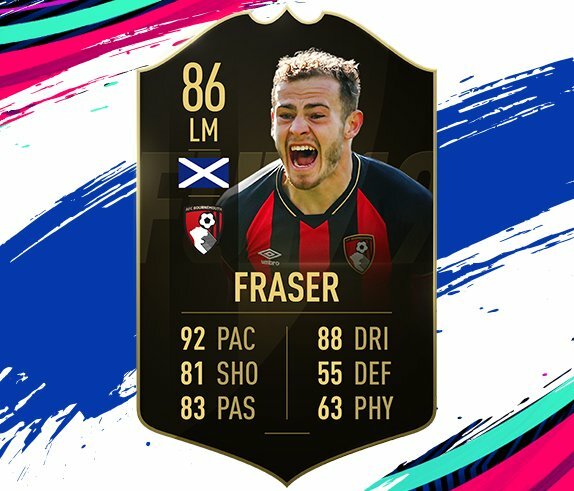 Ryan Fraser has developed into a distinguished Premier League performer after signing for AFC Bournemouth in January 2013. The Scottish winger progressed through the youth ranks at Aberdeen, making 23 league and cup appearances for the Dons before signing for AFC Bournemouth in January 2013. He made five appearances as the Cherries gained promotion to the Championship, his first few months at the club hampered by injury. Fraser featured in the Cherries' two seasons in the Championship, making 29 starts and 29 substitute appearances. He won a Championship winner's medal in 2015. He spent 2015/16 on loan to Ipswich Town, scoring six times in 21 games in all competitions and his season at Portman Road helped ready him for the Premier League. Eddie Howe rewarded Fraser with his first Premier League start in a 1-0 defeat against West Ham at London Stadium in August 2016. The Scot caught the national headlines after he came on as a half-time substitute to turn around the Cherries' fortunes in the home game against Liverpool, winning a penalty for the first goal, scoring the second and providing an assist for the third goal in the Cherries' famous 4-3 comeback win. Fraser’s performances also were noticed by Scotland manager Gordon Strachan who called him up to the senior squad in March 2017 before he made his debut against England in the dramatic 2-2 draw at Hampden Park. Among his six goals in another strong season in 2017/18 were a double to beat Everton at Vitality Stadium and the only goal of the game to claim a May win over Swansea City that confirmed Premier League safety for the Cherries. Fraser scored the Cherries' first goal of the 2018/19 campaign, his effort paving the way for a 2-0 win over Cardiff at Vitality Stadium on the opening day. He featured prominently as the Cherries enjoyed their best start to a Premier League season, netting twice in the 4-2 home win over Leicester and once in the 2-1 victory against Huddersfield at Vitality Stadium. Fraser also bagged his first senior goal for Scotland when he scored in a 4-0 win over Albania in a Nations League qualifier in November 2018. As at January 2019, Fraser had six full caps to his name – England, Netherlands, Hungary, Belgium, Albania, Israel. He also won six caps for the under-19s and 10 for the under-21s. AWAY KIT SPONSOR: Kingren Groundworks & Construction Ltd.